First Anglican bishop of Jerusalem; born of Jewish parents at Schönlanke, in the grand duchy of Posen, May, 1799; died at Belbeis, Egypt, November 23, 1845. His training was strictly orthodox, and at the age of sixteen he became a teacher of the Talmud and of the German language. In 1820 he removed to England and lived as a private tutor in various country towns, marrying, in 1821, a Miss Levy, of Plymouth. His study of the New Testament and the Prophets, and the suggestions of several Christian clergymen whom he met, resulted in his conversion to Christianity and his baptism, June 22, 1825, at St. Andrew's Church, Plymouth, in which town he had been officiating as ḥazan to the Hebrew congregation. His wife followed his example six months later, and was baptized in Exeter. Soon afterward, Alexander removed to Dublin, where he became a teacher of Hebrew, was ordained by the archbishop of the diocese, and appointed to a small charge in that city, June 10, 1827. He then became interested in the work of the London Society for the Promotion of Christianity among the Jews, and subsequently proceeded to Danzig, establishing headquarters there, whence he undertook to evangelize the Jews of West Prussia and Posen. In May, 1830, he returned to England, where for nearly twelve years he acted as home missionary of the society. In 1832 Alexander was appointed professor of Hebrew and rabbinical literature in King's College, London, which position he retained till November, 1841. His inaugural address was upon the value of rabbinical literature. He was associated with Dr. Alexander McCaul in the translation into Hebrew of the revised edition of the New Testament, and also took a prominent part in the translation of the Anglican liturgy into the same language. 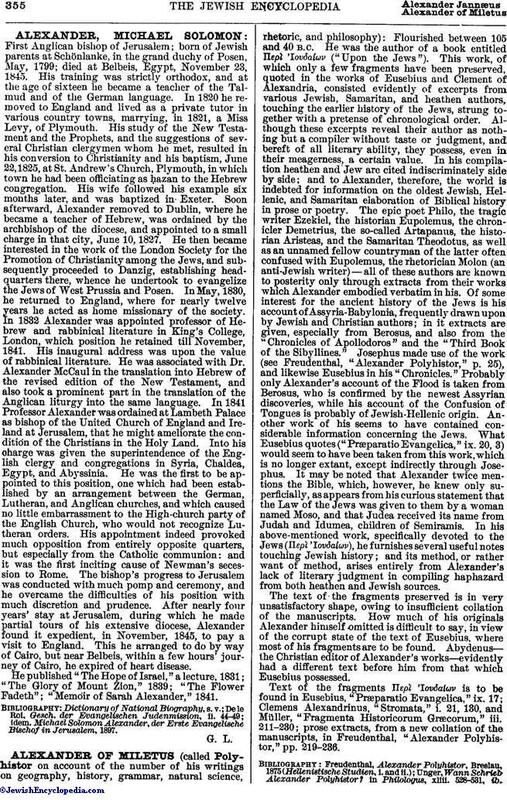 In 1841 Professor Alexander was ordained at Lambeth Palace as bishop of the United Church of England and Ireland at Jerusalem, that he might ameliorate the condition of the Christians in the Holy Land. Into his charge was given the superintendence of the English clergy and congregations in Syria, Chaldea, Egypt, and Abyssinia. He was the first to be appointed to this position, one which had been established by an arrangement between the German, Lutheran, and Anglican churches, and which caused no little embarrassment to the High-church party of the English Church, who would not recognize Lutheran orders. His appointment indeed provoked much opposition from entirely opposite quarters, but especially from the Catholic communion: and it was the first inciting cause of Newman's secession to Rome. The bishop's progress to Jerusalem was conducted with much pomp and ceremony, and he overcame the difficulties of his position with much discretion and prudence. After nearly four years' stay at Jerusalem, during which he made partial tours of his extensive diocese, Alexander found it expedient, in November, 1845, to pay a visit to England. This he arranged to do by way of Cairo, but near Belbeis, within a few hours' journey of Cairo, he expired of heart disease. He published "The Hope of Israel," a lecture, 1831; "The Glory of Mount Zion," 1839; "The Flower Fadeth"; "Memoir of Sarah Alexander," 1841.
idem. Michael Solomon Alexander, der Erste Evangelische Bischof in Jerusalem, 1897.